Providing your family with the very best produce is a 24/7 job. At TOPS, we're proud to be produce people. From the moment a seed is planted, we're on a journey with our produce. We carefully select innovative growers as our partners, but it doesn't end there. Our own produce experts ensure your produce is picked at the perfect moment, transported with constant monitoring and the utmost care, and then is rigorously inspected to meet our high standards. View this behind-the-scenes video showing how your fresh produce goes from farm to your neighborhood TOPS store. 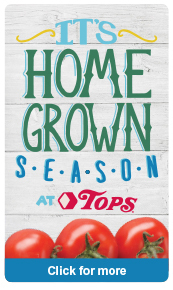 During local produce season, TOPS is proud to work with over 200 local growers. Some of these partners are family farms that have been growing for generations, and many have been part of the TOPS family for decades. Check out our Homegrown page to see what's in season, a map of growing partners and more! Getting fresh vegetables to your TOPS Friendly Markets at the peak of perfection is only half of the battle. The trick is to keep your fruits and veggies fresh in your home once you buy them. Keep asparagus in a glass of water like you would a flower. Onions make potatoes sprout, so keep them separate. Potatoes and fresh garlic thrive when stored in a dark place. Most fruit does best in dry conditions. Most vegetables keep best in humid conditions. At TOPS, we know it's important to have options you feel good about. That's why we take pride in offering products that contain nothing artificial, and are as good for your family as they are for the environment. TOPS is proud to offer more than 2,200 organic products storewide, including delicious produce; just look for the purple organic label! From your favorite national organic brands to our own organic line, Full Circle, TOPS has what you need to bring more organics into your home! Try some today!